This is a beautiful, eco-friendly, removable wallpaper made of quality paper with a self-adhesive backing (no extra wallpaper glue needed). It’s long lasting and fully removable, making it great for apartments, rentals, and an array of DIY craft and decorating projects. Removable wallpaper makes adding a one of a kind accent wall, or updating a whole room super easy! 1. Water Activated Wallpaper Rolls -- To install, simply soak in water (to activate adhesive) and apply to wall. 2. Peel + Stick Woven Wallpaper Rolls -- To install, simply peel paper backing and apply to wall. 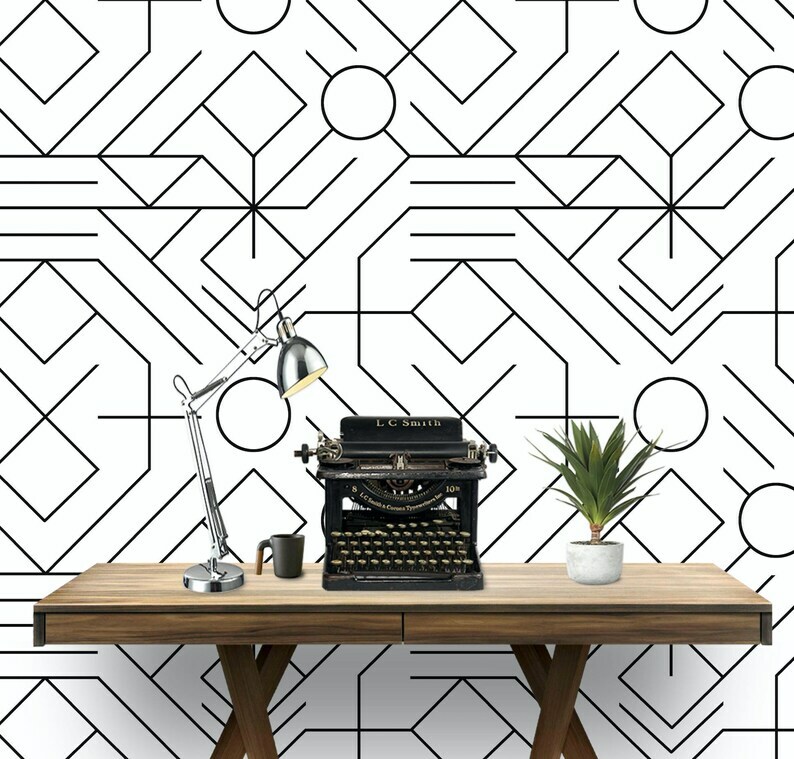 *This wallpaper is not printed with gold metallic inks. Rolls are 2 ft wide by 12 ft long. They overlap so the design works seamlessly across your wall. You may customize a roll by height in increments of 12 inches (1 ft)- up to 15 ft, but not by width (2 ft wide standard size). -Printed to order. The time it takes to print an order varies according to volume of orders currently being processed at manufacturer, current production estimate is 7-10 business days from the time you place your order. -Wallpaper works best on clean smooth walls/surface areas, and is not recommended for textured or uneven walls (areas). -It is highly recommended that before placing a large order you order a sample swatch first to make sure this wallpaper will work for your project, and you can test it out, so you can be completely satisfied. This is a print-to-order purchase and no refunds will be available. Will be shipped with care in protective sturdy tubes, and hanging instructions will be included. This shop accepts Credit Card, Paypal, Etsy Gift Cards, Yey! I trust that your order will arrive to you safe and in great condition, but if it does not please contact me directly for an exchange. All products are made to order (when you place your order production begins). Returns will only be accepted if the product arrives damaged and if you contact me within 3 days after receiving item. I will replace the damaged product and pay for shipping. At this time this shop does not refund any money, so please be 100% sure when placing any orders. All sales are final. To save you time and money, some products are produced and shipped from our partner manufacturing warehouse, and production of your order begins after you place your order and cannot be cancelled. All products are made to order, and will be shipped directly from manufacturer. Please allow 3-5 business days for shipping. For all wallpaper, the estimate time is 8-12 days for shipping. This estimate does not include travel time after item is shipped. Products will be shipped to the address provided on the Etsy Receipt unless otherwise stated at the time of order. For International Customers, please provide a valid phone number. Packages will not be insured unless requested at time of purchase, then additional fees may be required to fulfill this process. Please note: All taxes and duties for International customers are payable by the customer. Please note that each computer monitor is calibrated differently, so please keep in mind that there is always a slight possibility colors you see on your monitor will be a bit different from actual product once received. On some of my images digital textures (grain, spots, streaks, etc) and soft focus, or blurriness are done on purpose to create an abstract image, or add character and uniqueness to print. Please make sure you look at the print carefully before placing your order. Thank you for visiting my shop and ordering!